Well, after 4,000 miles, bureaucracy has put an end to my hope of using solely human powered means to cross the North American continent. No matter how much I reasoned with the Highway Patrol Officer, he would not budge. And this time, there were no alternatives. I left Hope in not much of a hurry this morning. Bill and Gerry invited me to stay with them again in Quartzsite, only 35 miles away. They had had a couple of big days on their bikes, and were going to make it a half day. Conisdering my two big days, I decided to make it a shorter day today too. Since they travel much faster than me on my skateboard, I told them I would call them once I arrived in Quartzsite. It was a nice downhill for five miles from Hope to the bottom of the wide valley, before US60 began a slow insidious climb. The road surface was rough, and a slight headwind was blowing. It felt like an age getting from Hope to where US60 joins with the I-10 freeway. I didn’t like the thought of going on the freeway again, but since there was genuinely no other alternative (well, apart from a remote 150 mile detour through scorching desert with no services compared with a ten mile downhill stretch to Quartzsite on I-10), I felt I was justified for using the freeway. I was two miles into a nine mile wondrous downhill on the smooth, 10-foot shoulder on I-10, seven miles from Quartzsite, when I heard a short chirp of a police siren behind me. I pulled off the shoulder onto the gravel, and waited for the police officer to get out of his car. We went through a similar dialog as I had with the other officer two days ago just out of Phoenix, except that I emphasised the fact that there were no alternatives, and that I was only going to be on the highway for another 7 miles, down to Quartzsite. “I’m sorry, but this a controlled access highway…” the officer recited. I reasoned with him that I was not just some young punk on a skateboard out for a joy ride. I reminded him that in order to skateboard to this point, I had spent a total of more than 600 miles on this very I-10 highway without either being kicked off by police or being run over, and that it was entirely ridiculous that I should be viewed any different from a bicycle (which is allowed on the freeway shoulder). He was as firm as a rock. “I don’t mean to be a kill-joy,” he said as he continued to recite the law. “You are being kill-joy,” I said. “Why is it that the dozen or so officers that I have spoken to over the last 3.5 months have allowed me to continue, seeing that I am conducting my travel in a safe way, and you are the only one that is creating a problem?” I said, all rather too emphatically, getting more and more worked up. Another police officer, who had been attending to another matter a few hundred metres up the road, once finished, now arrived to see what was going on. I told him I was skateboarding across America. “That’s awesome!” he said. He was the good cop. Had it only been him, I’m sure he would have let me off. Bad cop was not budging. “You cannot skate on the highway. I’m going to write you a warning.” Bad cop continued. Good cop went and got me a couple of bottles of water. Bad cop offered me a ride to Quartzsite. I declined, in a huff. I may as well have said “Screw you!”, such was my attitude at that point. I wandered towards the barbed wire fence that marked the freeway boundary. Half way there, Good Cop called after me. Looking back, the two officers were consulting a thick book, laid out on the boot of one of the cars. I walked back, and Good Cop explained that he was trying to give me a break. Trying to make sure there wasn’t some clause that would allow me to be on the freeway shoulder. I turned away and scuffed my feet as I walked towards the fence. Climbed over it. Re-adjusted my pack, and began the long walk down to Quartzsite, the town infuriatingly visible in the distance. About ten minutes into the walk, I was still fuming at the unreasonableness of the police officer. I had however realised that I may as well have taken a ride in the police car. 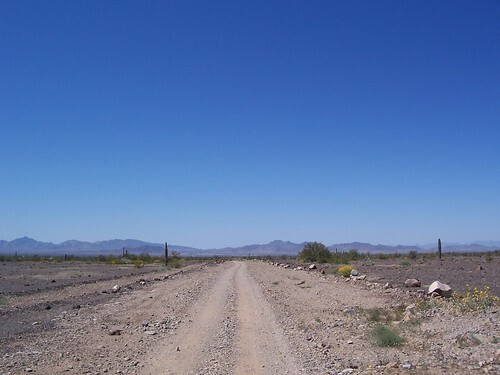 From Quartzsite to Ehrenburg, on the Californian border, a distance of about 15 miles, there is another unavoidable stretch of the I-10 freeway. I guess I won’t be on that on my skateboard. Looks like I screwed myself. It’s hot, dry, and these shoes were not designed for walking with a pack on one’s back. I’m getting blisters. I was upset. Cried even. Things like road construction or snow or other conditions that would force me to walk would be OK. Bureaucracy is such an invisible, incredibly insurmountable barrier. So frustrating. 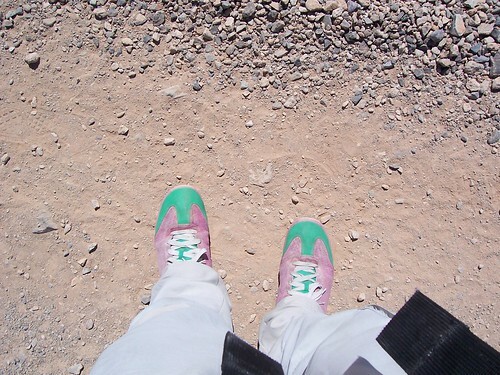 The pink shoes did get me to Quartzsite eventually however, and I met up with Bill and Gerry again at their campsite. Thanks guys. It was great to be with people when I was feeling down! My biggest concern now is how to get across California. The plan was to travel on I-10. Other campers are of the opinion that if the Highway Patrol is strict here in Arizona, I’ll have no chance in California on the freeway. What to do? I still need to make it to Hemet in….5 days. Along the freeway, this would be no worries. With the help of Bill and Gerry, we looked at a map and calculated the distance on the only other feasible alternative route; south around the Salton Sea, via the Glamis sand dune wilderness area. The alternative route worked out to be 250 miles. That’s 50 miles a day I would have to do in order to get to Hemet on time for the Lowe Syndrome Fundraiser. That’s a big ask. Perhaps I should just hitch most of the way across California? Having to go 250 miles out of my way is a little too much to ask, surely. I went to sleep undecided. Damn it, man, what a total bummer! Those cops were total jerks. What the hell freakin' difference should it make what freakin' diameter the wheel is! Arrrgggh! A pox on all their bleedin' houses! OMG I'm sorry that Cali cops are such stupid morons!!!!! That's why I refuse to live in that lame state ever again. Wow. What ever happened to common sense? Just be happy in that you are living an incredibly exciting life at the moment…which is obviously a huge juxtaposition with that of the loser cop! Hey Rob! Big respect and congratulations to your world record. It is amazing and admirable what you have achieved, not only on a athletic level but especially when it comes to motivating people! It's frightening how discriminating the system can be to everybody who's not conforming to the rules even though that individual might be using only his human power to move. And how fast these rules have changed. For millenia humans could move wherever they wanted and now this one form of mobility is oppressing all the others and more human ones in a never seen way. Taken our right to move freely over night. Wish you all the best for the final leg of your wonderful journey! Frustrating stuff, Rob. Dunno what I would've done.